You know what else is special about this Friday?? It’s an ACTUAL end to the work week for me for the first time in 3 years. Prior to quitting my day job, Friday was actually a short break before I spent the ENTIRE weekend working on my blog and client videos. Instead of working tomorrow, I’ll be sleeping in, beginning to take down our holiday tree and decorations, and beginning the prelimary plans for my massive spring vegetable and rose garden!! (!!!!!). Yay for Fridays!! 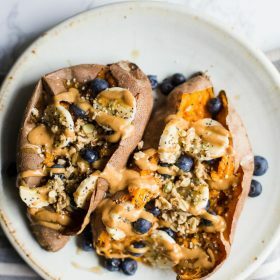 If you’re an avid B. Britnell follower then you might be aware that I already have a recipe on my blog for Breakfast Sweet Potatoes. But this one is different and quite frankly a little better because it has PEANUT BUTTER on it. The peanut butter was a very last minute addition to the recipe and it ended up being a total game changer. My suggestion is that you bake an extra sweet potato next time you’re eating them for dinner and then throw it in the fridge. The next morning or 2, you’ve got a SUPER easy breakfast that just needs to be heated up with a few toppings thrown on. 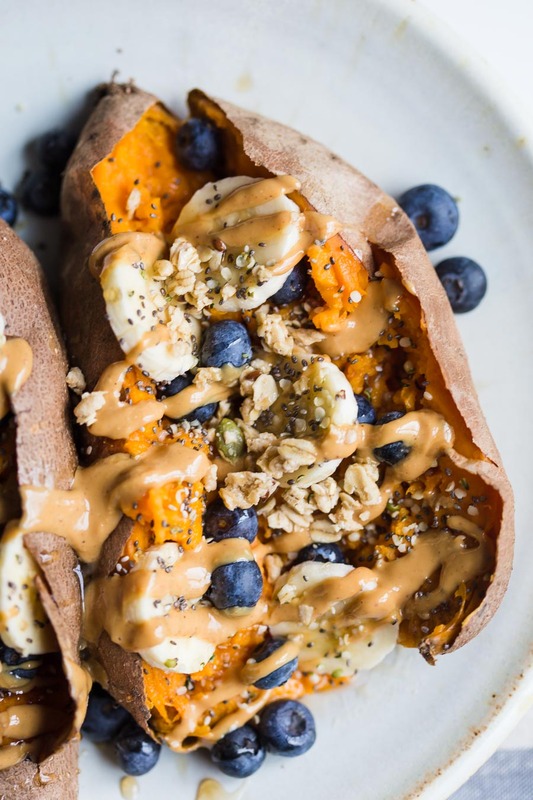 Alternatively, throw the sweet potato in the oven first thing when you wake up and then you’ll have breakfast ready in under an hour. 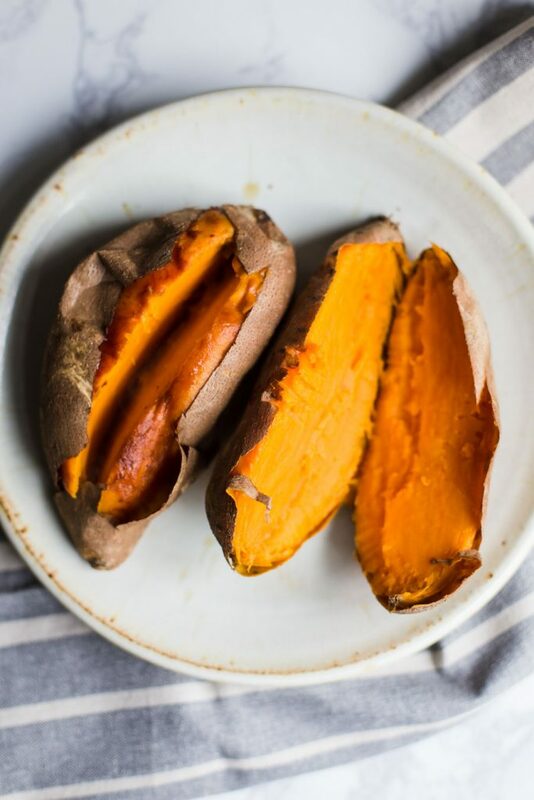 Oh and for sweetness: I tend to but organic sweet potatoes which I have discovered are ALWAYS sweeter and thus don’t need any added sweetener. However, if you want it all a bit sweeter, I highly suggest drizzling it with a touch of maple syrup or agave. SO GOOD! ps- you know what else this recipe is good for?? A super filling but still good for you DESSERT!! YES PLEASE!! Delicious idea. I had 1/2 sweet potato, 1/2 banana, peanut butter, honey, and cinnamon. Love it! 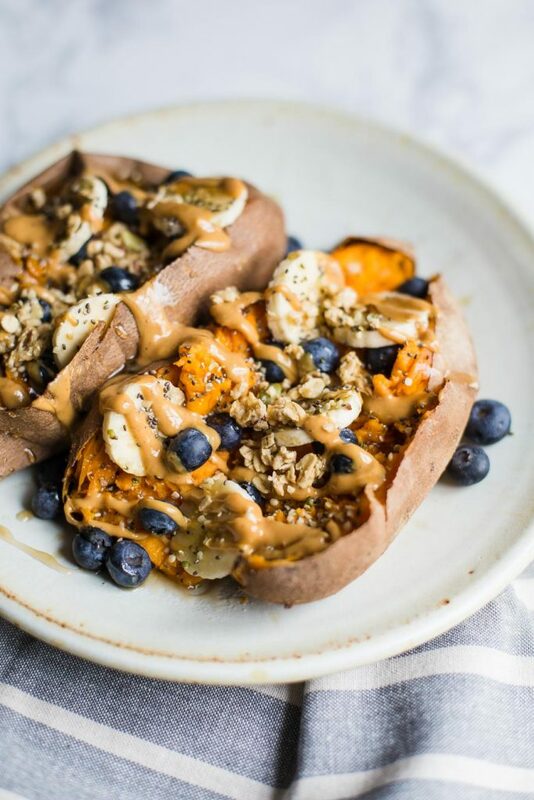 Just like oatmeal, you can top your sweet potato how ever you like! Pretty sinful!……..I would eat mine, nice and warm with some cinnamon poweder all over! Hi! Love this idea! I baked the purple sweet potatoes and for breakfast I plan to add sliced avocado, egg and some seeds. Loved this recipe. I baked my potatoes the night before so I would only heat up the oven once. The next day I sliced the potatoes in butter. I added walnuts, coconut, banana and a drizzle of peanut butter. It was the best!! Yay!! So glad that you liked it! I think baking the sweet potatoes the night before is KEY! The next morning breakfast is SO easy! Definitely going to give this one a try. Looks great. We just made this but switched up the toppings a bit to include: banana, flaxseed, granola, almonds, cashews, and sugar free maple syrup. Boyfriend added bacon on his for more manly protein!! Dang this was the best breakfast in a long time. We both give it a thumbs up 👍🏿 👍🏿!! Amazing! Thank you for posting. Just a great recipe, I love recipes with potatoes, they are easy to prepare and most of them are very tasty, such as this. And everyone can cook such a dish without any problems!